Here are some commonly asked questions and answers. If you have any additional questions, please don't hesitate to contact us. How do I secure your services for my wedding date? Once you decide you would like to reserve us, we will send you an invoice via PayPal to send your $50 non-refundable deposit. We book on a first come/first serve basis. Your date will be secured as soon as a deposit is received. The deposit will be applied to your total amount due for services. Deposits are non-refundable if you choose to cancel your appointment. Is there anything I should keep in mind when deciding how to do my hair and make-up? Yes. Please keep in mind that Costa Rica is a tropical climate, meaning hot and humid. If you're not used to this sort of climate, you will want to choose hair styles that keep your hair up and you cooler and more comfortable. March, April and May are the most humid months (April being the hottest AND most humid) so this is especially true in those months. Also, if you normally wear heavy face foundation, this may be a good time to start experimenting with how you feel about using lighter, mineral based make-up (such as Bare Minerals, etc.). These cosmetics tend to breathe more, thus, allowing the skin to cool itself and sweat less. Can you come to my hotel/condo for my wedding? Do you have travel fees? Please visit our Pricing & Booking Info page for travel fees. If your location is not listed, please contact us. How long will my styling take on my wedding day? Make-up generally takes about 30-45 minutes to apply. Average length and thickness hair takes about 1 hour. If you or anyone in your bridal party has very long or thick hair, please let us know so we can allot sufficient time for their appointment. Should I wear false eyelashes? Really, it's up to you. However, unless you are blessed with really great lush lashes (and some of you lucky ladies are!! ), using false lashes really does make the eyes "pop" in photos. It just adds a little something extra. False lashes don't have to be dramatic, which is what many people envision when they think of them. Chances are, most of the photos of wedding make-up that you've been admiring, have the models wearing false lashes. Here are two photos of eyes with and without lashes. Should I book a trial session? This depends on you, however we highly recommend trial sessions, especially if you are planning on doing your hair and/or make-up in a way you've never done. At your trial, we can get to know you better and gain experience working with your individual hair and make-up looks. Since there are no time restraints like there will be on your wedding day, we have time to experiment and find out what works best for you. 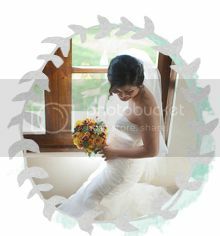 This way, when your wedding day arrives, you have the confidence that everything will turn out as you envision. When can I book my trial? Any date before your wedding day. How should I prepare for my trial and how long does it last? 1. Bring photos of the hair and make-up you have in mind. 2. Try to have all of the hair accessories that you will be wearing on the day of your wedding. 3. Bring any special make-up that you want to use. 4. Arrive with a clean face (taking special care to remove any residual mascara). 5. Apply your moisturizer at least 1 hour before. 6. Have your hair washed the day before and dry. Freshly washed hair does not hold styles as well. How long does the trial last? Most trials take about 2 hours, but there is no rush. We set aside time to work with you to create your perfect look. Where do the trials take place? You can either come to the salon in Tamarindo or we can come to you (travel fees may apply). What make-up products do you use? The majority of the cosmetics I use are made by Bare Minerals, Urbay Decay, Benefit and Make-Up Forever. I find these products work very well in Costa Rica's climate, are long-wearing, lightweight and photograph beautifully. However, if you have a particular brand of cosmetics that you prefer to use, feel free to bring those with you to your appointment(s). We can use a combination of products to achieve the look you want.